In Springfield, Massachusetts at the YMCA International Training School, known as Springfield College today, college basketball – and the sport itself – was created by Dr. James Naismith on December 21, 1891. Vanderbilt University played against the Nashville YMCA on February 7, 1893, which became the first game of basketball against an outside opponent, and the first official game between two colleges took place when Hamline University faced what is now the University of Minnesota on February 9, 1985. Dr. Naismith founded the Kansas Jayhawks men’s basketball program in 1898 and became the head coach and later the athletic director. His “Original 13 Rules of Basket Ball” can currently be found on the KU campus in the DeBruce Center. The NCAA became the official collegiate governing body for the sport in 1939, and today, there are 353 Division I men’s basketball programs in 32 conferences. College basketball features one of the most exciting postseasons in any sport, the NCAA Tournament, or what it’s better known as March Madness, which is one of the most bet on sporting events in the entire country each year. Before betting on a chalk or Cinderella team odds for March Madness or lines on regular season games and tournaments, we want to make sure you “survive and advance” by providing the best legal online sportsbooks for you to bet on college basketball. Are Online NCAAB Sportsbooks Legal in the United States? Offshore: Yes. There are no U.S. federal laws preventing the use of online sportsbooks if they are located offshore and are legally licensed. Each of the betting sites we recommend not only meets this requirement but are also among the biggest and most trusted brands in the industry for betting on college basketball and other sports. Domestic: Some states only. After the U.S. Supreme Court repealed PASPA in May 2018, it paved the path for sports betting to be legalized by state legislatures. Local sportsbooks are available in a few states, but online sportsbooks operated within the country are only legal in a couple states at this time. Bovada Sportsbook is the creme of the crop when it comes to sports betting for US players. 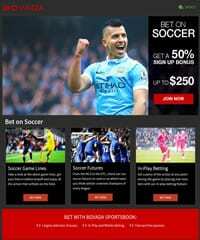 They are the highest rated sportsbook and cater exclusively to American players. As you may or may not know, Bovada is part of the one of the most reputable names in online betting (Bodog), so players know they are dealing with a 5 star company who pays out winners like a bank. Basketball fans can enjoy all types of wagering options including NBA, College Basketball and every other sport under the sun. They offer huge parlay payouts, some of the best in the industry and reward new depositing players with a 50% matching bonus up to $250. Outside of being one of the most reputable US online sportsbooks, we really love Bovada because they offer not only sports betting, but also horse betting and casino and poker action all under one roof so players don't need to go anywhere else. For NCAA Division I men’s basketball, there are 353 teams across 32 conferences. In total, 68 teams will qualify for the NCAA Tournament and have a chance at winning the national championship. The 32 conference tournament winners receive automatic bids while the remaining 36 teams are chosen by the NCAA Selection Committee, who also seed each team. A college basketball team must win 6 games in a row (7 games if seeded into the play-in) to win the national championship. Whether you’re betting on college basketball lines or odds, it’s key to know the schedule. Here are the dates for the most important tournaments and events happening during the 2018-19 Division I Men’s Basketball season. There are two things to look for when betting on college basketball, and you’ve likely seen both before: Odds and Lines. Click here to view all the current basketball odds and lines, courtesy of Bovada. For example, let’s say you see Duke (+200) when looking at the odds to win the national championship. To see the chance a sportsbook gives Duke, insert the (+200) into the formula. After using the formula, we now know the sportsbook gives Duke a 33.3% chance to win the national championship. You can use this for all types of bets such as point spread, money lines, futures, etc. to see the odds of winning a bet. Value is found when the probability in your model differs from the odds at a sportsbook. Point Spread: a bet that requires the favorite to win by a set margin and the underdog cannot lose by more than the same margin or can win the game. Money Line: a bet solely on which team will win the game. Over/Under Total: a bet on whether the total points scored by one or both teams will go over or under a set number of points. Top 10 College Basketball Fun Facts – Did You Know? Dr. Naismith is the only Kansas Jayhawks coach to have a losing record (55–60) during the prestigious history of its college basketball program. UCLA has won 11 national champions, more than any other school. Out of the 11 titles, 10 of which were won by legendary coach John Wooden. Three people have won a national championship in college basketball as a player and a coach: Joe B. Hall (Kentucky), Bob Knight (Ohio State/Indiana), and Dean Smith (Kansas/ North Carolina). LSU Guard and Basketball Hall of Famer “Pistol” Pete Maravich holds the record for the most points scored for a career in Division I history with 3,667 (1967-70) and for average with 44.2 PPG. Kevin Bradshaw holds the record for most points scored in a single Division I basketball game with 72 points scored against Loyola Marymount University on January 5, 1991. From 1967 to 1976, the NCAA banned the dunk in college basketball because Kareem Abdul-Jabbar, who is 7’2”, used it frequently dominate opposing players. The 3-point line was first tested at the collegiate level in 1945 but was not officially implemented in college basketball until 1986. Since 1986, the national champion receives the entire hardwood court used for the Final Four and championship game. The oldest coach to win a championship was Jim Calhoun, who won it for UConn at age 68 in 2011. The youngest coach to win it all was 31-year-old Emmett McCracken, who coached Indiana to the title in 1940. The 1992 Troy State vs. DeVry game was the highest scoring men’s basketball game at any level in NCAA history and the most points ever scored by a single team, which saw Troy State win 258-141 and many experts today consider both the team and total scoring records to be unbreakable.